Right of Way Magazine has an international audience of professionals employed by private industry and government agencies. 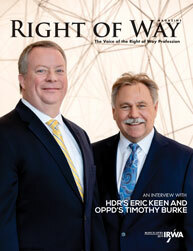 Recognized as the Voice of the Right of Way Profession, the bimonthly magazine features noteworthy infrastructure projects, industry updates and valuable information affecting all facets of right of way. Editorial contributors are experts in appraisal, engineering, environmental, relocation, surveying, transportation, asset management, land acquisition and real estate law.